Note: This function does not search Virginia Transportation Research Council releases. Get the latest transportation research news. RICHMOND, Va. – If you have plans to travel for the Easter holiday, the Virginia Department of Transportation wants to make your trip a little easier by suspending most road closures from noon Friday, April 19, until noon Tuesday, April 23. RICHMOND – Today Secretary of Transportation Shannon Valentine announced important leadership changes within the Transportation Secretariat. RICHMOND – Today, at the monthly meeting of the Commonwealth Transportation Board (CTB), Secretary of Transportation Shannon Valentine announced the launch of the Interstate 95 Corridor Improvement Plan. 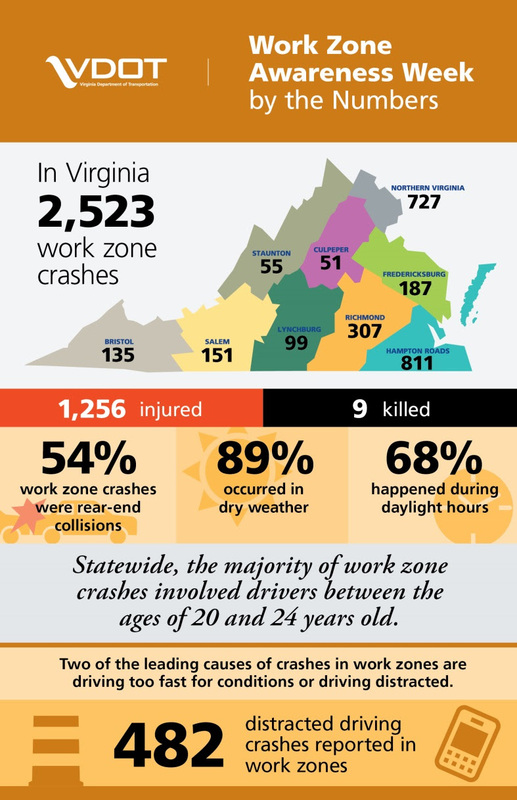 RICHMOND, Va. – The start of construction season is underway and the Virginia Department of Transportation (VDOT) is counting on you to commit to safe travel in Virginia work zones. RUCKERSVILLE—Governor Ralph Northam today proclaimed April as Highway Safety Month in the Commonwealth of Virginia. While the total number of crash deaths in Virginia was down in 2018, pedestrian fatalities in the Commonwealth were at a ten-year high. Governor Northam is calling attention to the rise in pedestrian casualties in the Commonwealth and nationwide to elevate awareness of dangerous behaviors and help save lives.